Last night (20th May 2015) was Round 2 of the Western Cyclocross League, and my second ever cyclocross race. Again we ended up in the suburbs, this time southern Bristol, on a wide open space sandwiched between a Gala Bingo and lots of houses on what appeared to be an old runway – it turns out that it was the old Whitchurch Airport, which was used until the mid 1950’s. First impressions with this broad stretch of tarmac and comments about the course then running down some tracks and along a ridge suggested that this would be a fast course, so I was expecting lots of time in the big chainring… how wrong could be I have been and this turned into a proper learning curve in the art of CX. First things first, due to a hectic family weekend, I hadn’t had a chance to look at the Kinesis since last week’s race and I should have done. During the ride to the registration area and a warm-up lap it was clear that the gears weren’t in full fettle. They were clicking across the range and wouldn’t hold the big sprocket, so it was back to the car to do some adjustments. Tightening the cable gave the pull to get the chain onto that big sprocket, but I also made a slight adjustment to the ‘low’ range on the derailleur… that was a mistake that’ll I’ll come back to later. Even with this fettle, the bike still wasn’t running desperately smoothly, so it’ll need a proper strip-down before the next race. The start was a fast run down the airway into the first bit of trail, and it was here that my first bit of learning kicked in. Being relatively flat I was expecting to hold the big ring and flick through up and down the gears on the cassette, but the combination of this sandy trail and the grass that followed proved that cyclocross bikes have two chainrings for a reason. The first lap was a slog, as I tried to drive along in that big gear, but then the penny dropped and I made good use of the smaller gears for the rest of the race. It shouldn’t be underestimated how hard it is to cycle over grass, which should make the winter CX interesting when it’s a combination of grass and mud. Towards the end of the first lap my fettling came back to haunt me. Because I was trying to hold the big ring, as I climbed back on after the dismount and headed for a climb up a grassy slope, I flicked the gears into the lowest sprocket and the chain promptly flew over the top and down next to the spokes. Fortunately it wasn’t jammed solid, but I lost a good few minutes trying to free it and when I was back on the home straight a chap in yellow & red, who I’d just overtaken before the mechanical, was well away in the distance. The next seven laps were pretty consistent and I gradually worked my way back to the red & yellow chap. 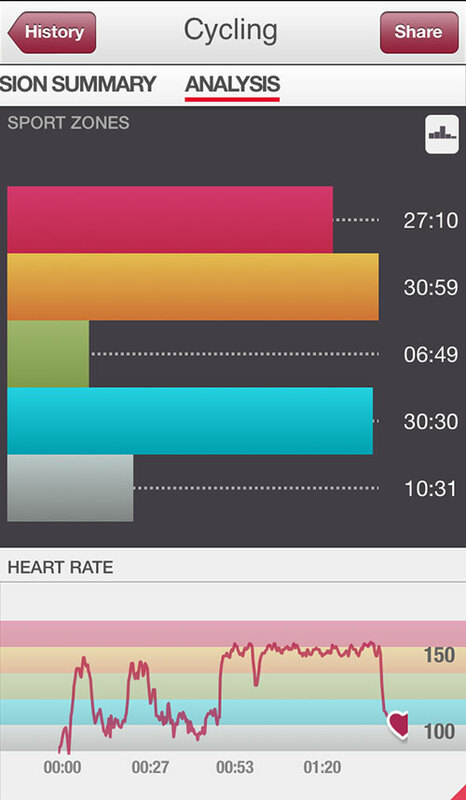 Anyone who’s considering doing a cyclocross race should take a quick look at the picture below – that shows my heart rate on the Strava record throughout the warm-up and the actual race, there is no let-up in a CX race, it’s just consistent hard work. It’s also worth taking a look at my Polar heart monitor record… Normally if I’m doing a hard ride or a run (I can’t run hard!) my heart rate hits the red for maybe five minutes over an hour, but on a normal ride you get a chance to recover, catch your breath and let your heart recover… you don’t get those breaks in a cyclocross race, so last night I spent 50% of the race in the red. A worthy mention also for the humble jelly baby. I’ve moved away from jelly babies on normal rides, they give short-lived sugar spikes that don’t work when you’re out for two hours or more, so I’ve moved to dates and dried fruit. 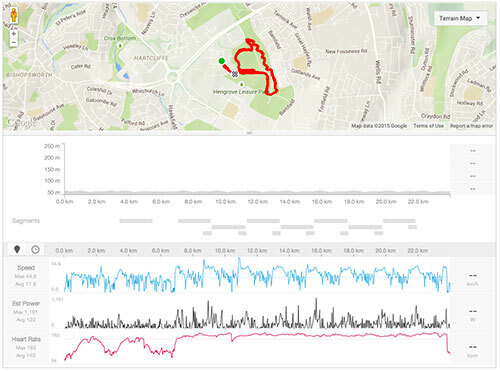 However, during a cyclocross race with five minute laps those sugar spikes are perfect, so my routine after the first twenty minutes was to get a swig of water and a jelly baby every lap, as I gathered my breath on the tarmac run into the start/finish line. As I passed the finish line for the bell, I had that yellow & red rider in my sights and managed to pass him just before we got into the grassy stage, only to have him pass me half way through this section. That was OK as there was a log laid across the route towards the end that I knew I could ride across (good ol’ mountain bike skills coming in handy), whereas I knew he was having to get off, so I’d get him back at that point… or so I thought. Just at the end of the grassy section there was a shallow ditch that had two approaches – until the last lap I’d been taking the right hand side, but in trying to get past a slower ride on the last lap I took the left hand route, which promptly caught my wheel, throwing me sideways into a big heap on the ground. So that was that, all I could do was hurl myself back on the bike, having first put the chain back on, and bust a gut in that last sprint to the line. o – Completed eight laps in 49 minutes and 11 seconds. o – 62nd out of 72 starters. o – 8th out of nine in the V50 category. Fastest rider in this category did eleven laps in 49 minutes. A link to my experiences in Round 1 is here and to the next round (Round 4) here.